Safety Score: 3,2 of 5.0 based on data from 9 authorites. Meaning please reconsider your need to travel to Lebanon. Lebanon with its capital Beirut is located in Asia (Middle East, bordering the Mediterranean Sea). It covers some 10,401 square kilometers (about one-third the size of Maryland) with a population of 6,229,790. Arabic, French, English and Armenian are the languages spoken by people in Lebanon (consider regional differences). Did you know that is sharing borders with Israel and Syria. Lebanon is a small country (10,452 sq km or 4076 sq mi in area with 3.7 million inhabitants) within the Middle East region with its capital being Beirut. The Lebanese people have had to adapt to the political turmoil. Lebanon is easily the party capital of the Middle East. Beirut features many different and distinct nightlife neighborhoods, such as Gemmayze district, mostly full of bars and restaurants, or the Monot Street which features nightclubs and bars. Lebanon is also known for it's open-air nightclubs such as Sky Bar, White, and Isis. Greater Beirut is a sleepless city, as the great majority of it open 24 hours a day. To reach someone Lebanon dial +961 prior to a number. The local cellular networks are operated on 900 MHz, 3G, 4G. Websites typically end with the top level domain ".lb". If you want to bring electric appliances (e.g. battery chaarger), keep in min the local 230 V - 50 Hz (plugs: C, D, G). The sign for the locally used currency Pound is LBP. 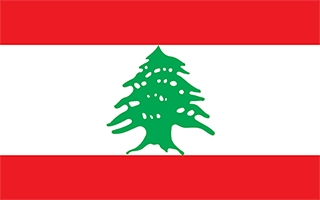 Three horizontal bands consisting of red (top), white (middle, double width), and red (bottom) with a green cedar tree centered in the white band; the red bands symbolize blood shed for liberation, the white band denotes peace, the snow of the mountains, and purity; the green cedar tree is the symbol of Lebanon and represents eternity, steadiness, happiness, and prosperity.